Oklahoma City is a long way to go for an overnight trip but as the occasion was Cindy’s Aunt Darlene’s 90th birthday it was a breeze to fly over and be there for a most happy celebration. A large collection of relatives were there and it was good to see them all at this happy event. Not such a quick trip this time, we managed 4 days in the Tucson area, ostensibly to warm up the bones from our wintry NW weather. Of course we managed to get there for some “unseasonably” chilly weather. But at least the sun was out! Unable to help ourselves, we indulged in touristy Old West stuff. On our way to Bisbee we stopped at Tombstone where several blocks are straight out of a western movie with dirt streets, wooden walkways and lots of people in period outfits. As the situation demanded, we plunked down a few $’s and watched a re-enactment of the Gunfight at the OK Corral. The rest of the day was spent walking the old mining town of Bisbee. Set in the hills of very southern Arizona the old buildings and winding streets make for a perfect walking tour. Lunch was good, too. 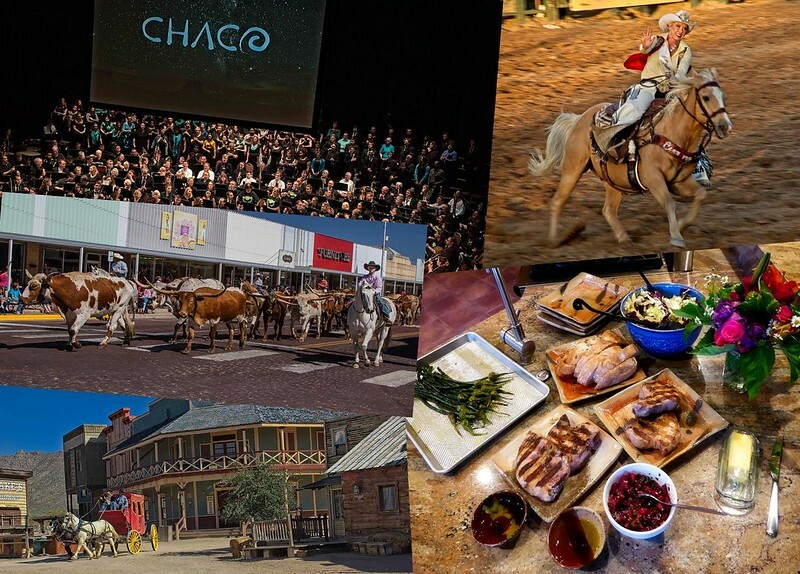 Not content with one taste of The Old West, we also ventured to Old Tucson, the set for many, many movies since the 1940’s. We were not recruited for any upcoming films. Mark Donnelly is the tenor who sings the national anthems for the Vancouver Canucks hockey games, having gained considerable fame with his marvelous singing during the Stanley Cup finals in 2011. We were intending to only be spectators when we sent him an email wondering when he’d be singing (the hockey being secondary as the Canucks were long out of the playoff picture). He got right back to us with a date in March and then to our great amazement sent another missive telling us to text him a bit before the game and he’d get us into the Canucks alumni box. After the first period we made our way to the 5th floor and were escorted to the box where we met Mark and a couple of former Canucks, one of whom insisted we stay for the 2nd period, which we did and chatted with Mark. A thoroughly enjoyable evening with wonderfully gracious hosts. On March 30th Cindy made her last trip home from the Mega-Enormous Law Firm. We’re now free to indulge in gross, hedonistic pursuits to our heart’s content! Having previously committed to providing photos to help make Cindy’s brother Gary’s Chaco Symphony “multi-media”, we were thankful for having 2 weeks free from commuting downtown to put the finishing touches on our portion of the program. Along with Native American flute (led by R. Carlos Nakai who also is the featured soloist in the symphony), Native American drumming, pottery and archeology workshops over the weekend, we were tagged to lead Chaco-centric photo workshops and then photograph the concert on the Monday evening. The 3rd performance of the symphony was at Touhill Performing Arts Center in St. Louis, a fitting venue for this version of the symphony. Over 200 performers were on the stage including the orchestra and chorus. Narration was recited between movements by William Least Heat Moon and our Chaco and Southwest photos were shown on a large screen above the orchestra. A full house gave an enthusiastic standing ovation at the conclusion. A truly magnificent evening. Shortly after returning from St. Louis it was time for Pioneer Days in Cindy’s home town of Guymon, Oklahoma. A week-long festival, it concludes with 3 days of rodeo and a parade down Main Street led by a herd of Texas Longhorn cattle. In our 3 days we managed to see all that, visit the rodeo horses, hit our favorite restaurants and make the mandatory appearance at Bob’s Cowboy Bar. Sometimes opportunity knocks, sometimes opportunity wags. At the end of May, Carl’s cousins Mark and Linda in Sisters, Oregon were embarking on a trip to Spain and Portugal and gave us that wagging opportunity to house sit and, more importantly, dog sit. Enter Dug, an 18 month-old wheaten terrier. A canine version of The Seven Faces of Dr. Lao, Dug exchanged faces for moods, among them: Happy Dug, Sad Dug, Playful Dug, Curious Dug, Flat-Lining Dug, Dish Lickin’ Dug, Boneless Dug (aka Very Limp Dug). Needless to say our days in Sisters were full keeping up with the various Dugs. Toward the end of our stay the Dug Diversion Corps arrived in the form of Carl’s cousins Kathie and Kay. Over the course of a couple of days, besides marveling at Dug, we enjoyed each other’s company and some sensational food mostly prepared by Kathie. An excellent chef, she made quick friends with the local green grocer and meat purveyor, turning the raw materials into delectable feasts. With the warm late Spring weather it was a wonderful respite to the chilly weather back home in Mukilteo. Chaco again! This time a chamber orchestra version in an indoor/outdoor venue near the small town of Abiquiu, New Mexico, about an hour northwest of Santa Fe. Once again R. Carlos Nakai and his wife and co-collaborator Pam were on hand. Despite some record heat the performance came off splendidly. And we still have half the year to go!